If you need a dead animal removed in West Linn, Oregon your have come to the right place. We are a professional wildlife control company that handles all animal problems throughout West Linn. 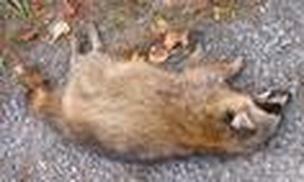 If you have a dead animal we can properly remove it, clean the area, and deodorize the area. We do not recommend handling dead animals without the proper knowledge and safety equipment to do so. When an animal has been dead for a while it can carry dangerous bacteria and germs. These can be left behind even after the animal has been removed. The most common area that dead animals can be found is under the house in the crawl space. In order for the animals to get under the house either a a vent is open, they dug in, or some other opening was found. After the animals are removed we are able to seal up the house so no other animals can get inside. But it is very important to make sure all animals are removed before sealing up the house or else you might have another dead animal problem. Besides the danger of disease and bacteria that comes with dead animals, the worst part is the smell. The odor can be very bad if there is no ventilation and is can move into the house. Even after the animal is removed the odor can still hang around because it can get on surfaces, but we are able to deodorize these areas for you. We use a food grade professional deodorizing fogger. This means that it is safe for children and pets. We are able to kill the odor under your house, inside your house, and in your attic. West Linn dead animal pick up is a service that should be performed by a professional with safety gear to prevent health risks. We recommend that as soon as you find a dead animal on your property in West Linn, Or, you contact a professional to have it picked up. This can prevent other animals, pets, and children from coming in contact with the dead animal carcass. Many times an animal will die in your yard or under your deck. For West Linn Dead Animal Removal Call 503-201-2432!